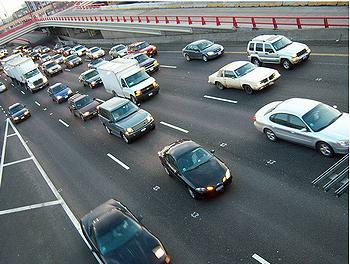 WASHINGTON, DC, August 2, 2011 (ENS) – The Obama administration and 13 automakers have agreed to boost the fuel economy of cars and light-duty trucks sold in the United States to 54.5 miles per gallon by 2025. The new agreement more than doubles the current Corporate Average Fuel Economy, or CAFE, Standard of 24.1 mpg. Making the announcement on Friday, President Barack Obama was joined by representatives of Ford, GM, Chrysler, BMW, Honda, Hyundai, Jaguar/Land Rover, Kia, Mazda, Mitsubishi, Nissan, Toyota and Volvo – which together account for over 90 percent of all vehicles sold in the United States. Officials of the United Auto Workers, and the State of California, who helped to develop the agreement, also were present. “We’ve set an aggressive target and the companies are stepping up to the plate. By 2025, the average fuel economy of their vehicles will nearly double to almost 55 miles per gallon,” said the President. In late 2007, CAFE standards received their first overhaul in more than 30 years when President George W. Bush signed into law the Energy Independence and Security Act of 2007, requiring that automakers boost fleetwide gas mileage to 35 mpg by the year 2020. In May 2009, the Obama administration pushed the 35 mpg target forward to model years 2012-2016, raising fuel efficiency to 35.5 mpg and beginning to save drivers money at the pump this year when model year 2012 vehicles debut in the fall. The 2025 standards agreed Friday build on the Obama administration’s earlier agreement for model years 2012-2016. Achieving these fuel efficiency goals will require innovative technologies and manufacturing that are expected to spur economic growth and create high-quality domestic jobs. These programs, combined with the model year 2011 light truck standard, are expected to save American drivers $1.7 trillion dollars in fuel costs, and by 2025 result in an average fuel savings of over $8,000 per vehicle, the administration says. The new standards are expected to result in savings of 12 billion barrels of oil in total. By 2025 they will reduce oil consumption by 2.2 million barrels a day – as much as half of the oil the U.S. presently imports from OPEC countries every day. The standards also curb carbon pollution, requiring performance equivalent to 163 grams per mile of CO2. The administration says the standards will cut more than six billion metric tons of greenhouse gas over the life of the program – more than the amount of carbon dioxide emitted by the United States last year. The nonprofit alliance Go60MPG, a joint effort of Environment America, the National Wildlife Federation, Natural Resources Defense Council, the Safe Climate Campaign, the Sierra Club, and the Union of Concerned Scientists, applauded the agreement, but encouraged all parties to do more. “We remain convinced that automakers have the technology and American innovators have the know-how to take us even further and reach 60 miles-per-gallon and beyond,” the alliance said in a statement. The U.S. Environmental Protection Agency and the Department of Transportation have worked closely with auto manufacturers, the state of California, environmental groups, and other stakeholders for months to ensure these standards are achievable, cost-effective and preserve consumer choice. The program would increase the fuel efficiency standard for passenger cars by an average of five percent each year. The standards for pick-ups and other light-duty trucks would increase an average of 3.5 percent annually for the first five model years and an average of five percent annually for the last four model years of the program, to account for the unique challenges associated with this class of vehicles. The key to taking significant amount of weight out of a vehicle without making it smaller is to substitute lighter, yet stronger materials such as advanced composites like carbon fiber, Rucks advised. At only one-third the density of steel, carbon fiber is able to absorb up to six times more crash energy than aluminum.